Revlon youth FX range - Dry skin approved? I have to say I didn't expect loads from this range with it being targeted towards wrinkles and ageing skin. However I didn't think about the fact that a lot of ageing skin is also quite dry meaning it could actually be more suited to my dry skin. The Primers are absolutely gorgeous, they smooth the skin. Meaning not only do they do a great job of minimising the look of wrinkles but also do a fab job of making pores less obvious. I feel like for me I am not going to reach for the forehead primer often mostly because I have a fringe however it is a little lighter than the other one, which reminds me a lot of porefessional. So I perhaps would use the forehead primer all over the face for a lighter smoothing effect. I have to say when the foundation came out the tube I almost didn't try it. It's an incredibly thick mousse like texture and I could almost imagine it clinging onto every dry patch I had however once I began to blend it in with my sponge it left a medium coverage but incredibly light weight layer on my skin which looked so satin like and healthy. Due to the texture I expected a heavy matte look however it just left my skin looking healthy and glowing which is exactly what I want a foundation to do. Finally moving onto the concealer, it was probably the product I liked the least out of the collection however I definitely don't dislike it. Again like the foundation it is very light weight however for me and my very dark eye bags it just doesn't offer enough coverage. I think if you only need a little concealer this would be perfect however I do find myself reaching for much higher coverage products. I would love to know if you have given this line a go and what you think of it. It's been a while since I've bought myself any makeup and after receiving my marks back for my first university assignment (which I got 81% on) I thought it was time to treat myself. 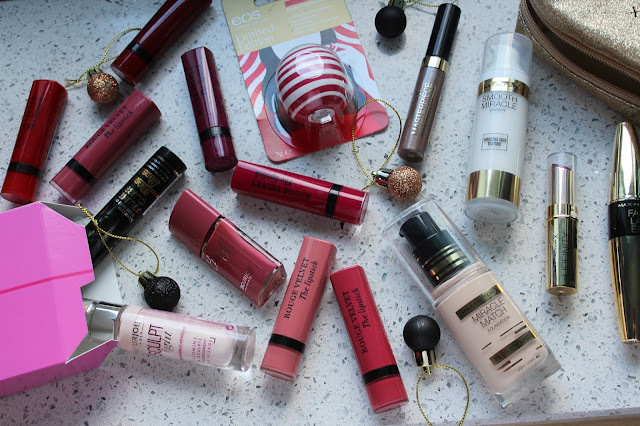 I love buying makeup at this time of year as there are so many gifts with purchase which are super hard to refuse hence my haul. I'm not going to talk about what was in the gifts with purchase as it will make this super long but if you do have any questions about them leave them in the comments and I'll get back to you. First off I have been looking at giving the Maxfactor miracle match foundation a go for such a long time and when I saw they had a gift for purchase I decided it was time to give it a go. I am so glad I picked this up, I am so impressed with the way it sits on my super dry skin and I can honestly say it is one of the best foundations I've tried from the drugstore. To get my total haul from Maxfactor up to £15 I also decided to give one of their liquid shadows a go. After trying the Essence liquid shadows which I absolutely love I've been looking to try some more. I went for the shade coffee which is quite a cool toned bronze shade but I thought it would make the perfect base for a brown smokey eye. Moving onto Bourjois I went a little crazy for the new Rouge velvet lipsticks as I've heard such good things about them. It didn't help that they were also on three for two and had a £2 off introductory offer. I picked up six shades but another can in the gift with purchase so I'm definitely going to be putting up a review but for now I can say that I am incredibly impressed with them, the only think is I wish the colour selection was a little wider as although the shades are gorgeous they all have a very similar tone to them. Randomly I also picked up a little EOS Sphere lip balm in a limited edition peppermint flavour because it's just so cute and I love a good minty lip balm. So that's it for today, I'd love to know what drugstore makeup you have picked up recently. Now I know a lot of people wouldn't take any makeup on an adventure holiday however on my recent trip to Wales I took a couple of bits just in case we did anything in the evenings. The local pub definitely did not need to see my exhausted bare face! Today I thought I would show you what I took as for me it was the perfect little capsule makeup bag. Primer wise, I packed the Stila one step primer as it is super nourishing on the skin and I thought my dry skin would be appreciative of something very hydrating. For base I kept it very light, the Nars Pure radiant tinted moisturiser is one of my all time favourite bases as it sits so comfortably on my skin. I took this as I knew the weather would be cold and that my face was going to have to deal with being battered by the elements. What I love about this is that even though it has all the properties of a tinted moisturiser it offers a really lovely medium coverage. Concealer wise I took Urban decay Naked skin for underneath my eyes as it is just my go to under eye concealer and I also took Clarins instant concealer as it can be worn all over the face which was perfect for the night I just wanted a really small amount of coverage. When used in a targeted way this also has incredible high coverage for how light weight it is. For the rest of my face I decided I;d just bring along a bronzer and a highlight. Bronzer wise I bought Mac Refined Golden as it is a beautiful slightly sheeny super natural looking bronzer. It almost reminds me of a lighter Nars Laguna. Now this is in a limited edition packaging however it is available in the permanent line. For highlight I packed Laura Geller Gelato swirl illuminator in Ballerina which is a stunning baby pink highlight shade which is perfect for when I am super pale, so a good 11 and a half months of the year. This just added a little glow without being too intense and over the top. For eyes, of course I packed my trusty Urban decay primer potion which you will know if you are a regular reader I take everywhere with me. then for shadow I packed the Dose of colours Baked browns palette as it is just perfect for travel. It has five beautiful matte shades which are super easy and quick to work with and is a palette I would one hundred percent recommend to everyone. For my brows another very trusted product was packed, I pretty much always take my Anastasia Dip brow in medium brown with me as I know I can trust it not to smudge and end up all over my face. Finally for my makeup bag I took this super teeny adorable Urban Decay perversion mascara* I love a good travel size and this one is super slim so seemed the perfect one to pack. I'd love to know what you take in a very minimal makeup bag. 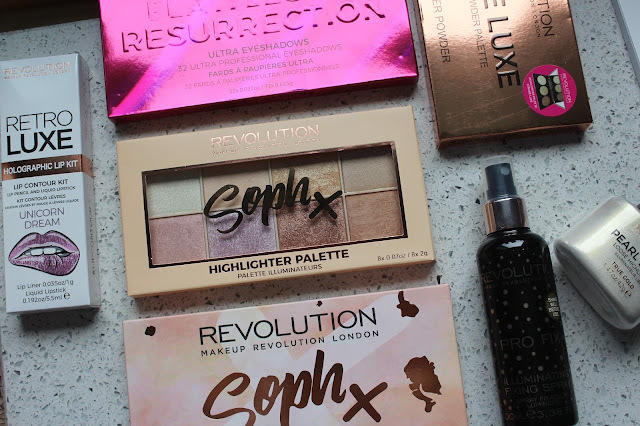 It's been a while since I bought anything from makeup revolution, but when the Soph does nails collaboration came out I knew I wanted to give it a go. I mean look at the shadow palette it's absolutely beautiful. So obviously I picked up both the Sophx shadow palette which I have to admit I'm not as impressed with as I first thought I would be the mattes are beautiful however I find the shimmers just don't give enough pay off when they are used with a brush. I find they have to be wet which I don't mind but it's just a bit of a faff meaning I don't reach for it as often as I thought I would. Other than that the shadow shades are absolutely gorgeous and you can create such a huge variety of looks. I do really like this I just don't find I reach for it as often as I should. Moving onto the highlight palette, surprisingly this was my favourite out of the two. I was a little worried I'd find it too intense as Soph always has a super blinding highlight however I actually really like the shades. As long as I use a fan brush and don't pack it on I find you can get a really lovely subtle look from these. I love the shade range in this and it is a brilliant way to try out some more out there highlight shades without going crazy. I love the lilac on my super pale skin but I also love to mix up the shades so I end up with a pinky lilac or a gold based pink. You will probably know if you are a regular reader that I am a little obsessed with unicorns so when I saw that they were bring out a sheeny unicorn lip kit I couldn't resist, am I going to wear it? Maybe not but it was only £6 and I couldn't resist. Its a gorgeous duo chrome white gloss with a purple lip liner which just looks so cool. I also picked up the Dewy setting spray as it is something I have been curious about. I'm always on the hunt to find a setting spray which matches up to the Urban decay All nighter. This one is a little different as it takes away more dryness however doesn't make makeup last any longer. I picked up the Pearl lights loose powder highlight as I thought it would be really nice to mix into foundation to add a little bit of sheen. It's also really pretty just used on the cheek bones. I went for the true gold shade as I tend to reach for pinky highlights so I thought it would be something a little different for me. Finally I picked up another two palettes, the first being the Strobe luxe palette, if you hadn't already noticed I went a little highlighter mad in this order. Again this is a really beautiful subtle highlight palette and I absolutely love the patterning in the pans, it really reminds me of the Laura Mercier Christmas palettes. I especially love the palest shade however I find I can actually use all three shades on this skin which is something which doesn't happen very often. Finally I picked up the Flawless 3 Resurrection palette which is a gorgeous Burgundy based palette which is so my kind of palette. I definitely feel like the the quality of this is better than the Soph palette especially on the metallics. So that's it for today, I hope you enjoyed this post and I would love to know if you have tried any of these products before! Any old school readers will know I am a warm eyeshadow person and this time of year is definitely my favourite time of year for seasonal makeup. Today I thought I would share with you some of my favourite autumnal warm palettes at the moment so without further ado, lets get on with it. Rimmel Brixton brown - This is the most affordable out of the bunch, this is one that did the rounds a couple of months ago and was incredibly hard to get hold of. It's a really lovely little palette and a good one for if you want to try deeper berry tones on a budget. The only problem is that this doesn't have any matte shades in it however one of the browns isn't too sparkly so can be used in the crease. Violet voss Holy grail - I absolutely adore this palette especially some of the deeper pink shades, I feel like this one just has a good mix of everything from golds, to basic transitions to deep cranberries. These really do blend like a dream and if you felt like the Naked heat was missing some more basic lid shades you should definitely give this one a go. Primark Master palette - This is another amazing budget friendly palette. This one has a lot more shades then the Rimmel quint so would be great for anyone who is a little more advanced but doesn't have a huge budget. Don't get me wrong a few of the shadows aren't the most amazing quality but some of them are super lovely. Anastasia Modern renaissance - I adore this palette and if you are a regular reader you will know that this is one of my all time favourite palettes. The shadows are beautiful quality and the shade selection is just perfect. If I had to pick one of the palettes this one is definitely the one I would suggest you buy if you don't already own it. NYX Warm neutrals - This is another really lovely budget friendly palette. It is definitely a higher quality than the likes of Primark and Rimmel so is a good in the middle option in terms of price and quality. This one doesn't have any crazy shades so is the perfect basic warm palette. Coloured Raine Queen of hearts - This is the craziest palette out of the lot. Although it has a lot of basic warm toned colours it has a gorgeous pop of colour. The shimmers are so pigmented and give a gorgeous super foiled effect making this one also perfect for the Christmas season. Rimmel Brixton brown, Violet voss Holy grail, Primark master palette, Anastasia Modern renaissance, NYX Warm neutrals, Coloured Raine queen of hearts. Is this palette not just the perfect everyday combination for anyone who loves a warm brown. If you are a regular you will know I love a good warm brown as much as the next blogger so when I saw Kathleen lights talk about this I just knew I had to have it. The palette contains 5 completely matte shades which have one of the most incredible formulas I have ever come across. I also an in love with the packaging although it is a nightmare to photograph and keep clean but it looks gorgeous! The shades in this palette are all beautiful basics which means it would make the perfect palette for a beginner. They blend like an absolute dream and are some of the most pigmented matte shades I have ever used. So the shades we have are Tealight which is a basic matte cream, Deserted which isa warm light brown which somewhat reminds me of one of the shades in the Kat Von D shade and light palette. Then we have outdoorsy which is an incredible terracotta warm brown which is probably my favourite out of the palette. Then there is Cherry wood which is a heavily red based brown which is borderline red brick and then finally we have rock bottom which is the least warm toned out of the bunch, it is a really lovely basic slightly warm toned deep brown. Overall I am really obsessed with this palette and I would highly recommend any warm toned eyeshadow lovers give it a go. I can see the mauve one just falling into my beauty bay basket very soon.